"When computers move into people's homes, it would be most unfortunate if they were merely black boxes whose internal workings remained the exclusive province of the priests." Ok. I admit it. The MacBook Air upon which I'm typing IS a black box, or rather, a mysterious slim silver one. And, if you are like me, this is exactly what we love about our computing devices: they just magically seems to work. 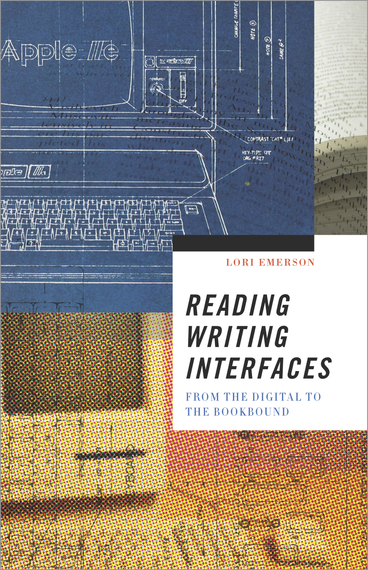 In her valuable new book, Reading Writing Interfaces: from the Digital to the Bookbound, Lori Emerson asks us to reconsider the inevitability and desirability of the "invisible" computer interface. This is a topic of critical importance for everyone. Although the book focuses on writing and reading practices, the reader can easily picture the broader political and social implications of blindly embracing "the ideology of the user-friendly" that turns "all computing devices into appliances for the consumption of content," hermetically sealed boxes that are inoperable outside the parameters pre-set by the manufacturers. Reading Writing Interfaces attempts to "demystify" the interface by excavating the histories of "neglected, failed, or dead media." As director of the University of Colorado, Boulder's Media Archaelogy Lab, Emerson is well suited to this task. Arguing that the interface's power to create potentialities and constraints for writing and reading is not unique to computing, she offers the fascinating example of Emily Dickinson's practice of pinning pieces of text over other pieces of text to create a polymorphic reading/writing experience. Here, as in the rest of the book, Emerson is less interested in elucidating how the roots of digital writing can be found in older practices than she is in illustrating how the medium itself, in Dickinson's case, pen and paper, in the case of digital poetry, the computer, affect and restrict the art forms that emerge from them. In fact, the awkward positioning of the Dickinson chapter at the end of the book helps make this point. Whereas, in a digital milieu, this non-linear structure might seem "natural," in print, it hangs naggingly like a loose thread. It is precisely these kinds of "failures," Emerson argues, which unveil and reveal the workings of an interface. Reading Writing Interfaces begins contentiously with what might best be described as an academic smack-down of Apple's proprietary device: the iPad. Summoning "a future generation of hackers who will be driven to find a way out of this flat notion of creativity that amounts to little more than consumption and manipulation as users are turned into audience members watching their devices perform magic tricks before their very eyes," Emerson goes on to describe an alternate, forgotten history of touch-based interface. Myron Krueger's Videoplace is an installation in which two participants interact bodily (Videotouch) with each other's projected screen image to create a shared world. The main difference between it and the iPad interface is that Krueger was intent on creating "a new graphic experience" that would "highlight assumptions and expectations of which we are never aware, because it does not occur to us that our world could be other than what it is." In Videotouch, the "laws of cause and effect are composed by the artist. The beauty of the displays is not as important as the medium." Even given the autocratic constraints Apple places on the development of apps for the iPad (for instance, the unexpected, ie. easter eggs, is explicitly forbidden), a few writers such as Jorg Piringer, Jason Edward Lewis and Erik Loyer do manage to "express and explore" the medium itself and the plastic nature of written language. Some writers such as Deena Larsen, Talan Memmott, and Judd Morrissey specifically harness glitch, "Jane spaces", and "gaps" and potential inefficiencies in software for their work. In Samplers: Nine Vicious Hypertexts, Larsen hijacks what are meant to be purely functional spaces in the Storyspace program to create what she calls " a shadow story of the main text." In this way, she draws attention to "the way in which process and (writing) product (are) unavoidably intertwined. In a related, but opposite move, Young-Hae Chang Heavy Industries rejects the trumped up promise of individual expression through software. Reusing the same simple black font on a white background and allowing no interaction save the ability to click away or adjust the volume, YHCHI offers an aesthetic equivalent of Bartelby the Scrivener's subversive rejoinder, "I would prefer not to." YOUNG-HAE CHANG HEAVY INDUSTRIES, Traveling to Utopia: With a Brief History of Technology at Bryce Wolkowitz Gallery from Bryce Wolkowitz Gallery on Vimeo. 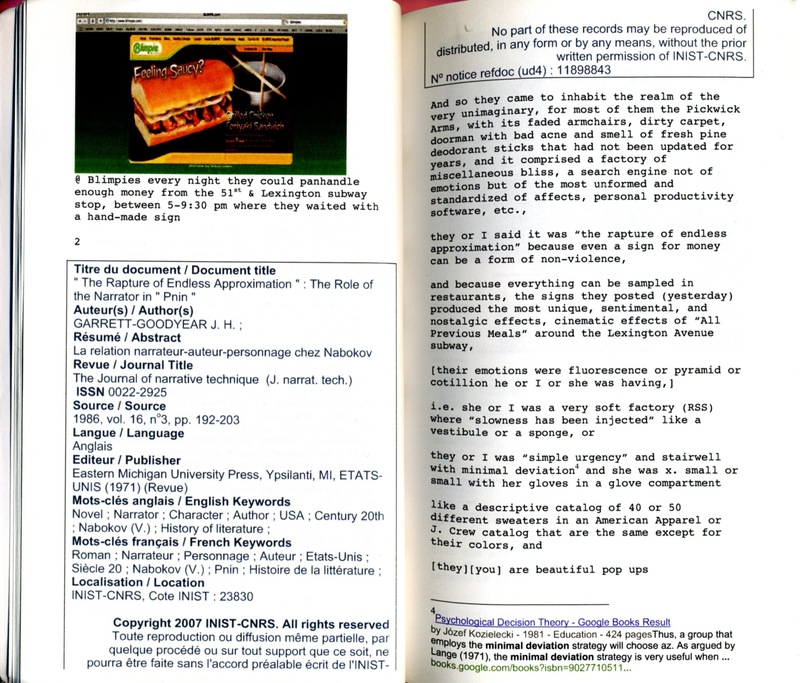 In clear, non-academic prose, Emerson traces a concise media archeology history from the relatively "open, extendible, and flexible" systems theorized and created by Douglas Englebart (oN-Line System), Seymour Papert (Logo programming language), Alan Kay (the unrealized Dynabook and Smalltalk software) and Steve Wozniak (Apple II) to the "closed, transparent, and task oriented" graphic user interface of the Apple Macintosh. Emerson argues that by attempting to make the interface "invisible", current computing devices opacify the underlying mechanisms, thus, making it impossible for non-experts to "have access to (understanding) both the mechanisms and the flow of information underlying the machine." 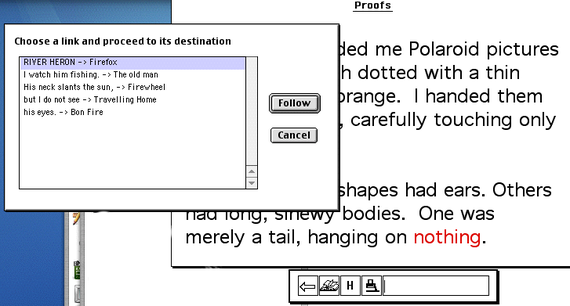 Early digital poetry reflects the "tinkering" potential of early devices. Experimental poet bpNichol uses the command line interface of the Apple II to create code poems that are not necessarily executable, but which harness the reader's presumed knowledge of how computers work. bpNichols First Sceening, See 7:15. "Off-Screen Romance"
In a fascinating and illustration-filled chapter examining the "dirty" concrete poetry of bpNichol, Steve McCaffery, and Dom Sylvester Houédard, Emerson seeks to re-evaluate old media in light of the new. She argues that, under the influence of Marshall McLuhan's lesser known theories of media, these poets sought to "hack" the medium of the typewriter (Dom Sylvester Houédard's "typestracts"), the photocopier (bpNichol's Sharp Facts), and, the book itself (McCaffery's Carnival). Emerson ends her book with a chapter on the "Googlization of Literature." Here, she points out that interconnectivity has created a feedback process of "readingwriting" which, she argues, "signals a definitive shift in the nature and definition of literature." The use of algorithms and search engines for the production of poetry not only undermines the modernist ideal of the "singular, intending" genius author, it reveals that these mechanisms are never politically, socially, or culturally neutral. 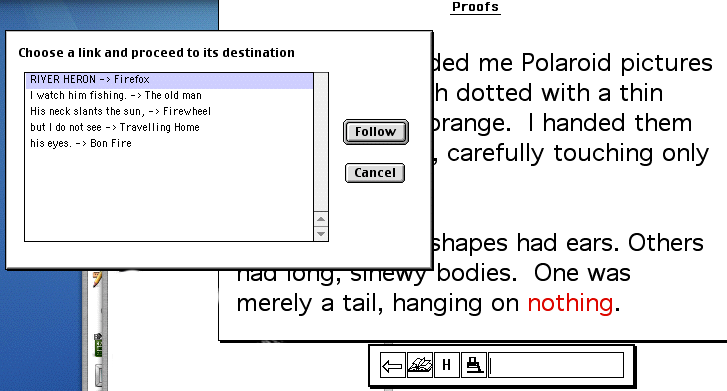 Unlike earlier digital poets, more contemporary poets like Bill Kennedy and Darren Wershler, and John Cayley and Daniel C. Howe are less concerned about the "surface effects" of the interface and more concerned with how our reading and writing is shaped by and interacts with search engines and other networked systems. Emerson offers the example of HEATH: plagarism/outsource, notes toward the definition of culture, untilted Heath Ledger project, a history of the search engine, disco OS. Here, poet Tan Lin has assembled various pieces of text and jpegs mostly lifted from Internet searches to create a "novel within a network" that threatens conventional notions of authorship and the book itself with a radically democratized, extended, and idiosyncratic process of writing. HEATH continually reminds the reader that these isolates and the novel itself are part of a vast evolving ecology in which different species of text: blog posts, essays, literature, Samuel Pepys' diaries, recipes, advertising copy, and opinions and images all coexist. What, then, is the future of literature? Emerson offers no firm conclusions, but suggests that, in a world where the goal is to make readingwriting interfaces disappear, the book may find new life as a frictional, defamiliarizing surface for born-digital texts that resists transparency, efficiency, and surveillance. JOIN ME in New York, Thursday, December 4th, 6:30 P.M. at the New School. I will be participating in a panel discussion on innovative and immersive literature.